Should I connect the integration from Expensify or from Zenefits? It's totally up to you! You'll have the same options available to you when syncing from either product. Login to Expensify > click Settings > Policies > Group > [Policy Name] > Connections. Scroll down to Zenefits, then click Configure. In the configuration dialog, select your preferred approval workflow, then click Save. If you still don't see users as Synced in Zenefits, try the steps below. Login to Expensify to check the configuration status. You might see the option to Retry the connection between Expensify and Zenefits. 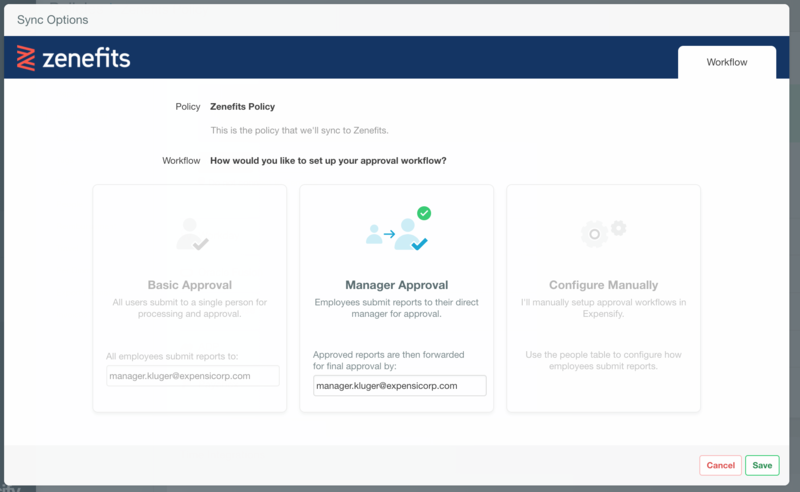 For example, if you change your password or admin permissions in Zenefits, we'll ask you to Retry and give you the option to enter your new login credentials. If there's no Retry button, click Sync Now to import the newest employees and update all users. If Sync Now doesn't seem to do the trick, we suggest disconnecting and reconnecting the integration. Select Do not connect to Zenefits to disconnect. Will Expensify import Contract or Part-time employees? Nope! We only import full-time employees, who are marked as active, not terminated. Oops! All employee records in Zenefits must have their work email address. Before connecting to Expensify, be sure to add work email address. Users should merge their two Expensify accounts into one Expensify account.